Lisa is a beautifully elegant looking woman, with long black hair, a wonderful chocolate skin tone, seductive eyes. She is very much in shape because of her history in sports. Lisa is a fun loving lady who enjoys making people laugh, even at the expense of others. She's a jokster, a fantastic actor, and can always keep a poker face in the middle of the largest prank. She sometimes suffers from bouts of depression when things are not going her way, but these moments are few and far between. Track and field, Running, Hurdeling, Jokes, Pranks, Reading, Holo-Novels. Born in 2350 in the city of Luanda, Angola. Lisa enjoyed a life of competition, she started out as an athelete and went into track and field professionaly. She did this for several years during her teens and her entire twenties and won several medals in events. However, she never was never able to make it beyong the Earth Olympics and never qualified for any Universal events. 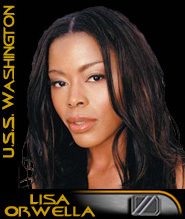 She retired from sports at the age of 31 and attended the Academy to start a new life in Starfleet.